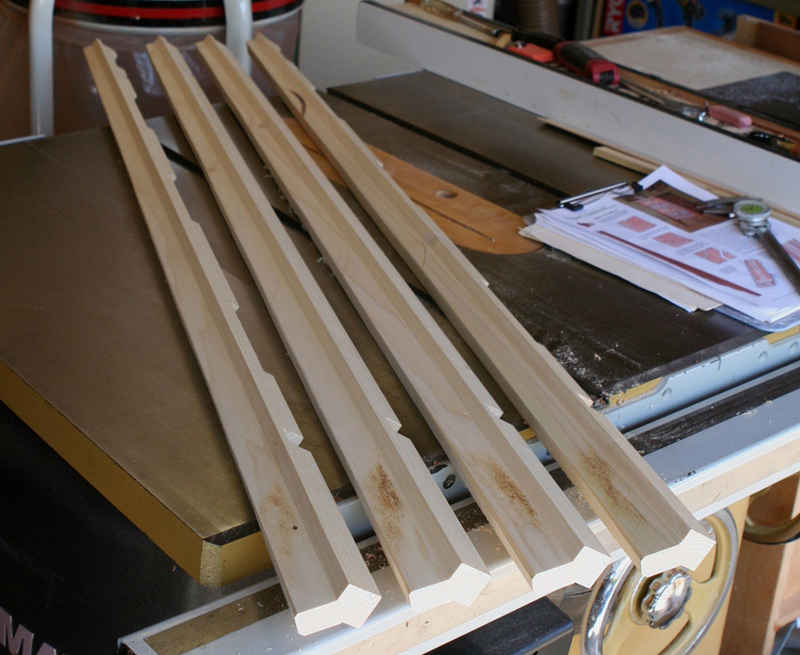 After much casework, I finally get into the fun part: creating the shaped legs. 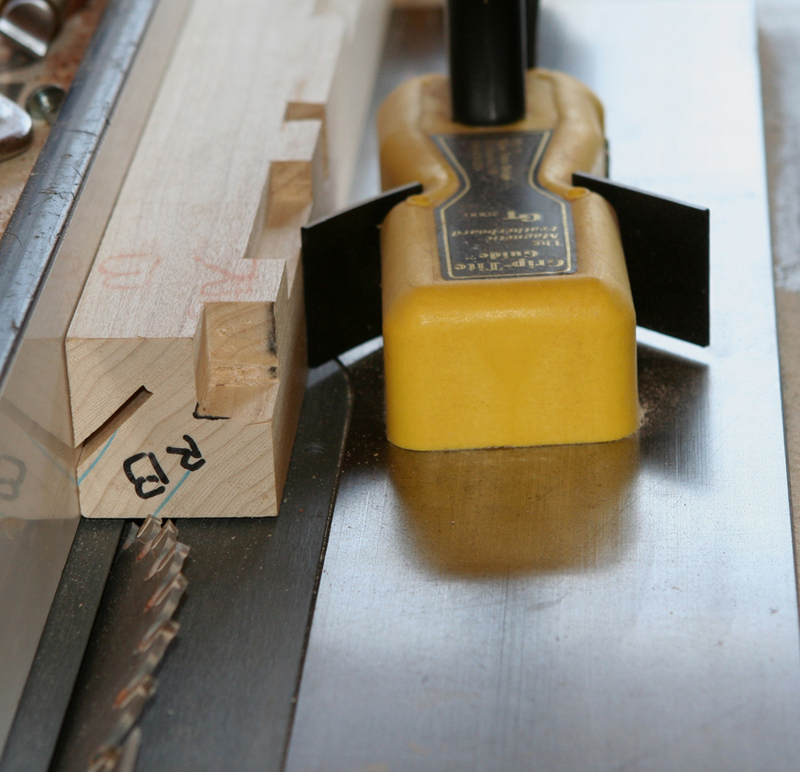 To create the fin, I mark two 45 degree lines to yield close to a 3/4-inch thick fin. Perpendicular lines are drawn which will determine the protrusion of the fin at its widest part. 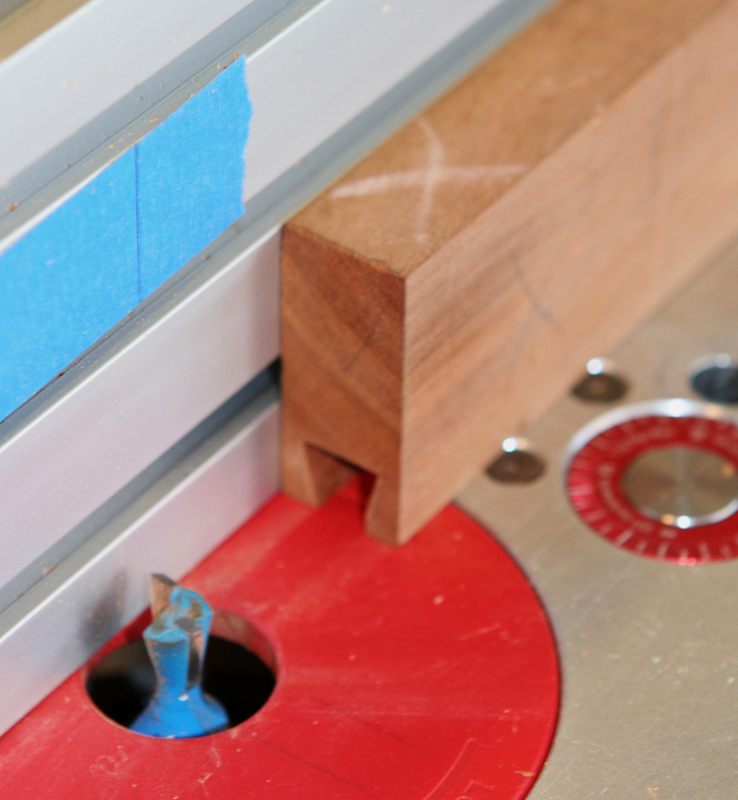 The beveled rips, followed by the perpendicular cuts are a bit tricky to keep the workpiece against the fence and table saw surface. I used feather boards to keep the legs against the fence. If my fence accommodated them, some feather boards or similar devices would have been useful. 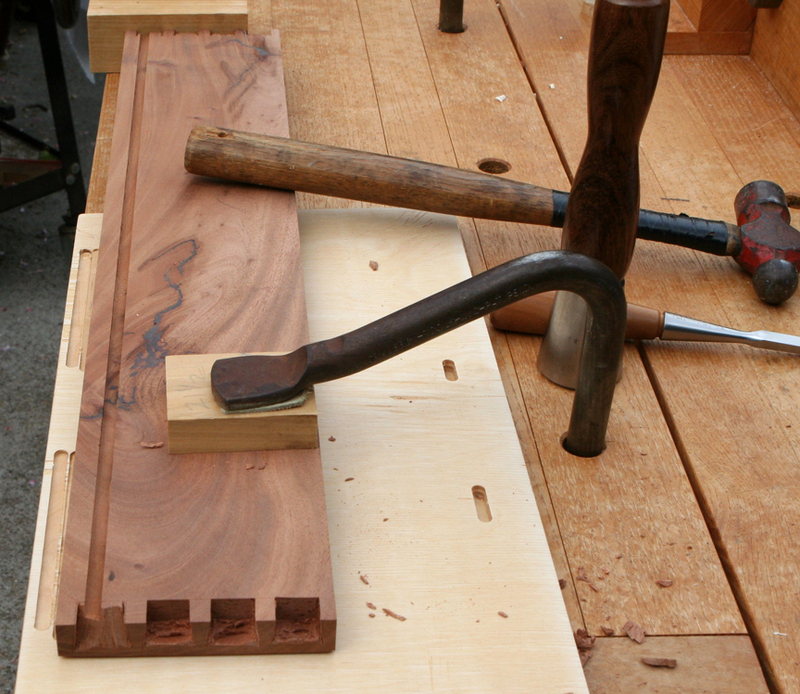 I did my best to hold the legs in the cut using a long and heavy push block. 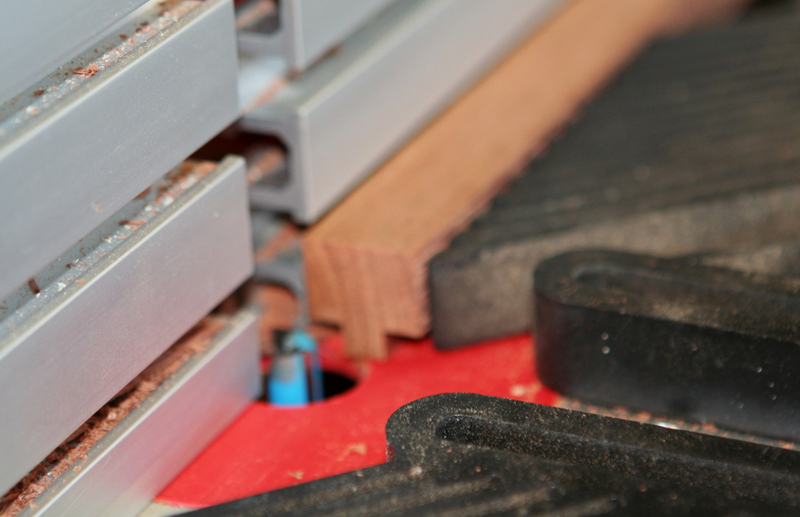 As the perpendicular cuts freed the waste the footprint of the workpiece is dramatically reduced. 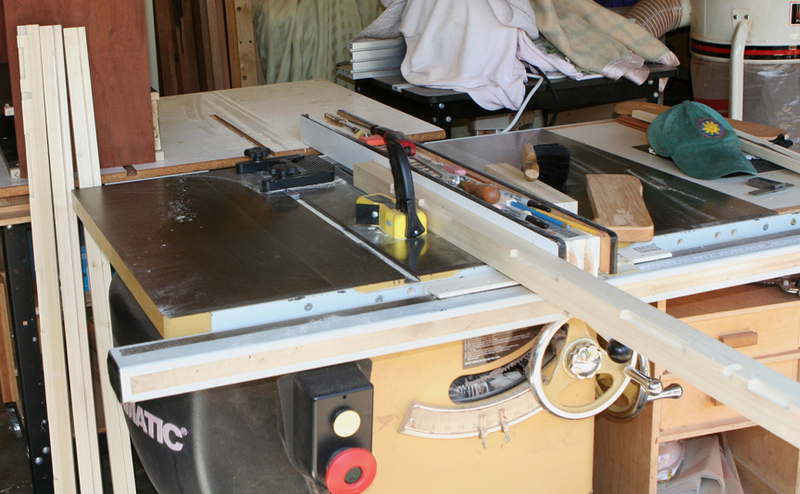 Working at a table saw should always be done with full attention and wits. 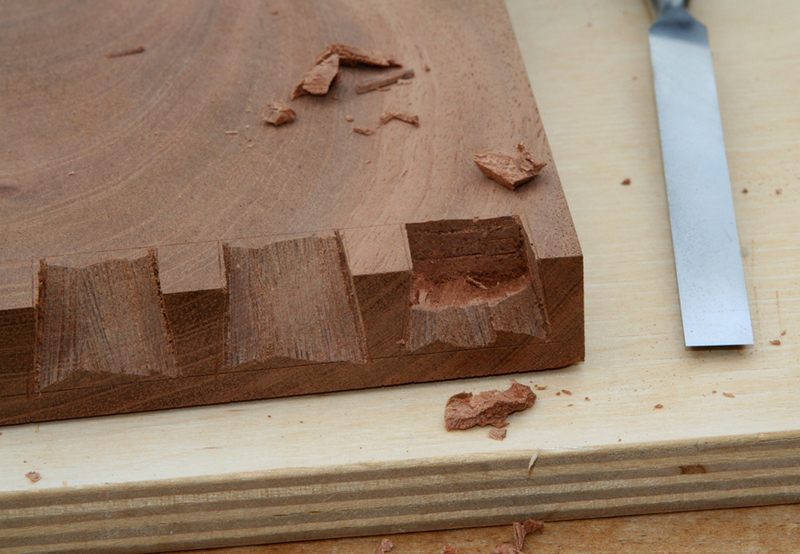 Whatever full attention is, double it, for these last two rip cuts. This leg design was written of by well-known designer and woodworker, Hank Gilpin, for a 2015 issue of Fine Woodworking Magazine. Earlier I had made a prototype of the leg to gain experience with the techniques and to evaluate proportions. I appreciated the impact this design had on shadows and visual planes. 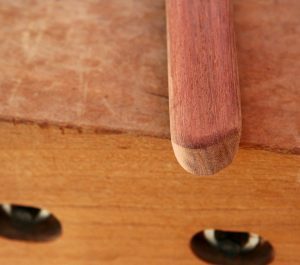 I marked the fin taper with a long straight edge and made a sled to hold the legs at the required 45 degrees from any flat reference surface. 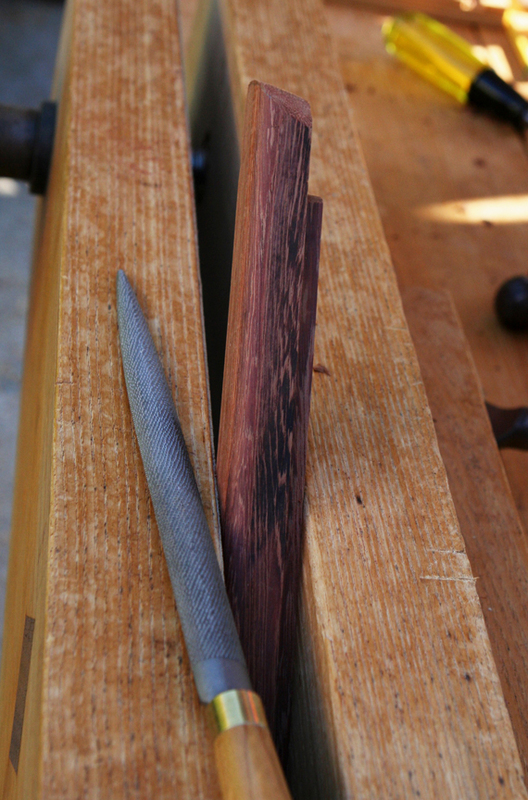 The long tapers were made at the band saw trying to keep 1/32 of an inch on the waste side of the line. 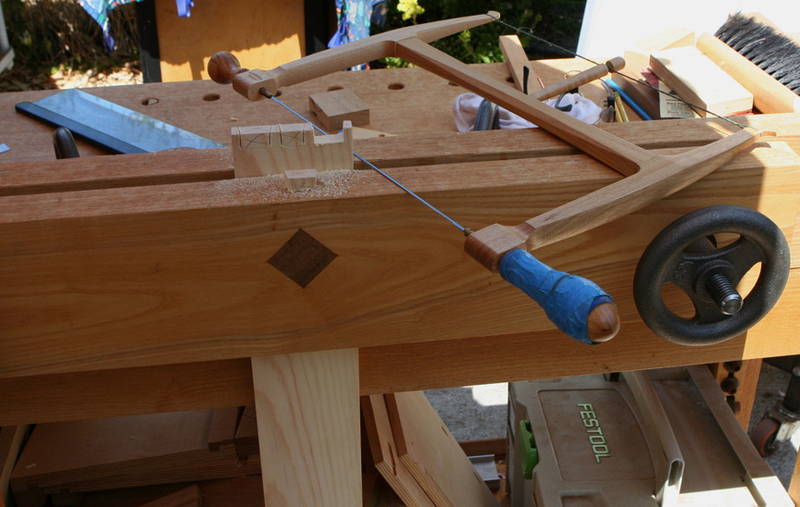 The same sled was also used to hold the leg while I created the round over for the fin. I used a circle template to draw some guidelines on the ends of the legs. I did not work to those lines, but rather attempted to make them look and feel appropriate. 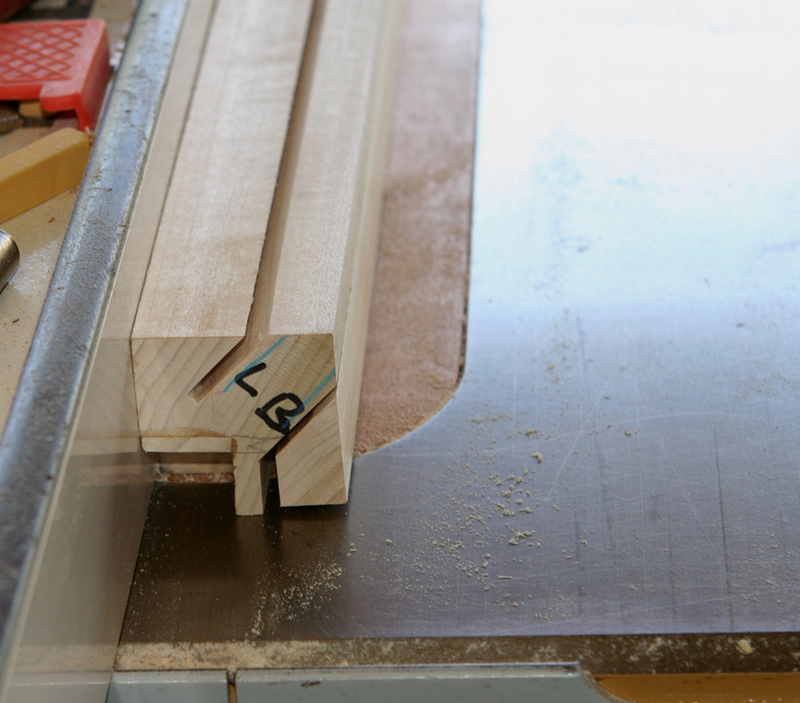 Next up, shaping the inside corners of the legs that protrude past the case bottom. 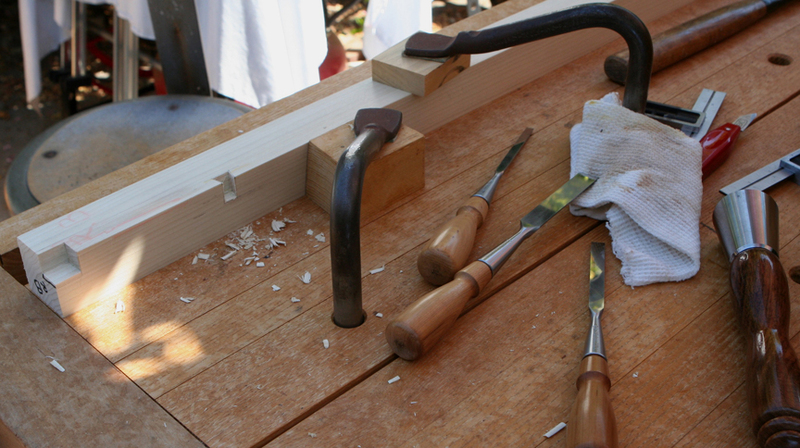 The legs will be glued on the long grain to the long grain of the case sides. 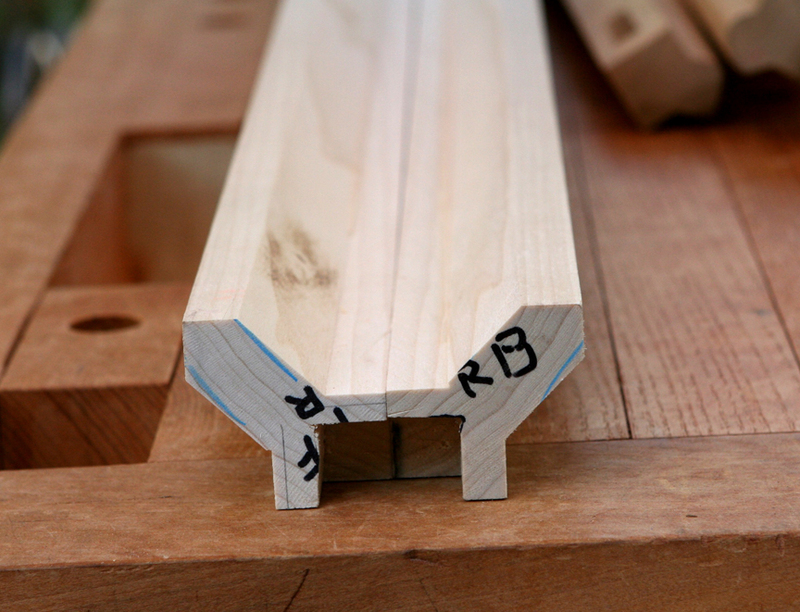 They will also be constrained by numerous stub tenons of various shapes and sizes. I had difficulty keeping track of the joinery orientation when the case switched to face down to on its side to face up. A few patches and fresh paring was required as I went along. I worked on one leg at a time. 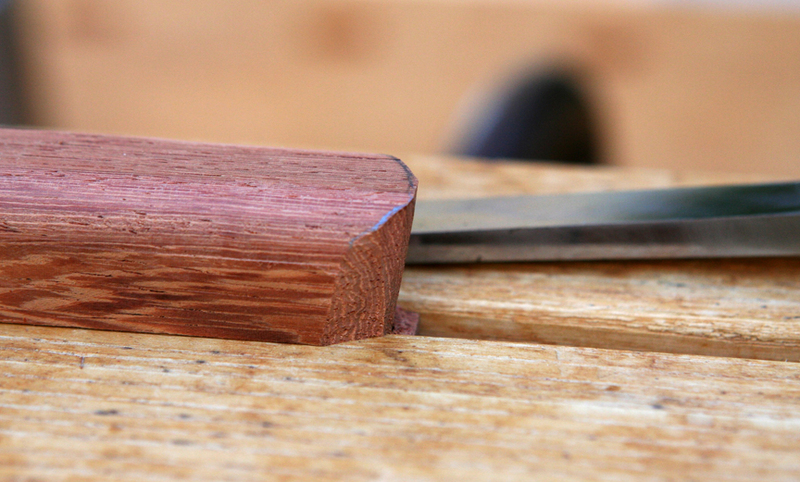 Each “mortise” was marked, chopped and test fitted, then the next mortise was marked with the initial one partially in place. I did not trust the case to be perfectly symmetrical or square so I did not batch out my markings. 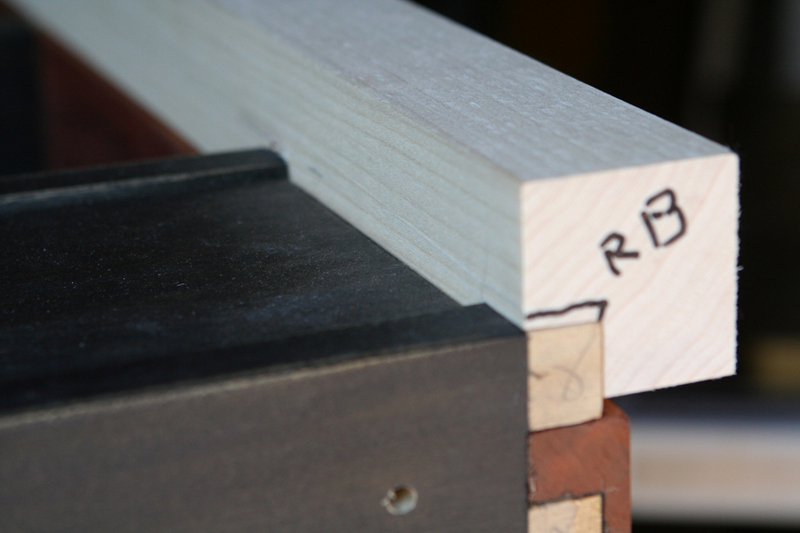 For simpler builds I often mark one leg, then mark the others from those marks. Not this time. 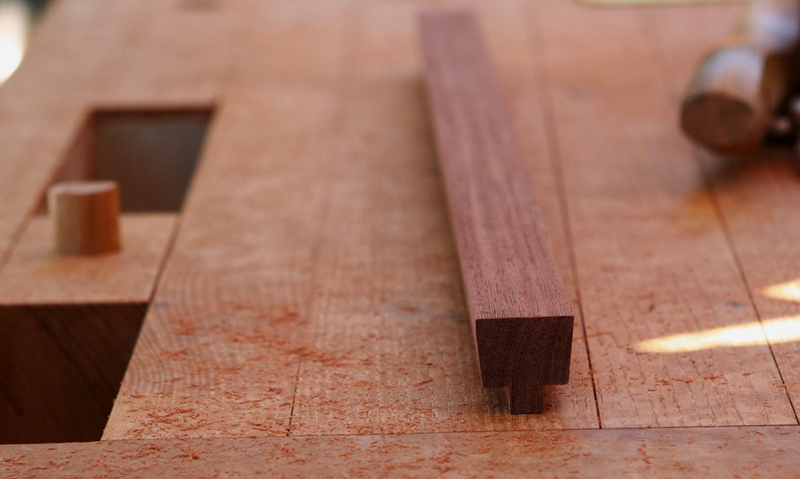 Not sure why I decided to use the long stub dovetails for the outer back boards. There are many good reasons not to and probably not a much structural advantage to this approach. But when simple can do the job, why should I stop at simple? 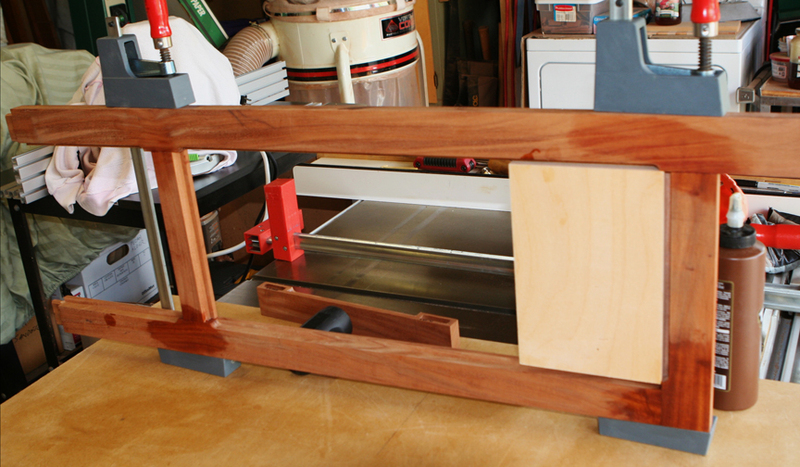 With the front legs in place I trimmed the doors to just fit the opening. 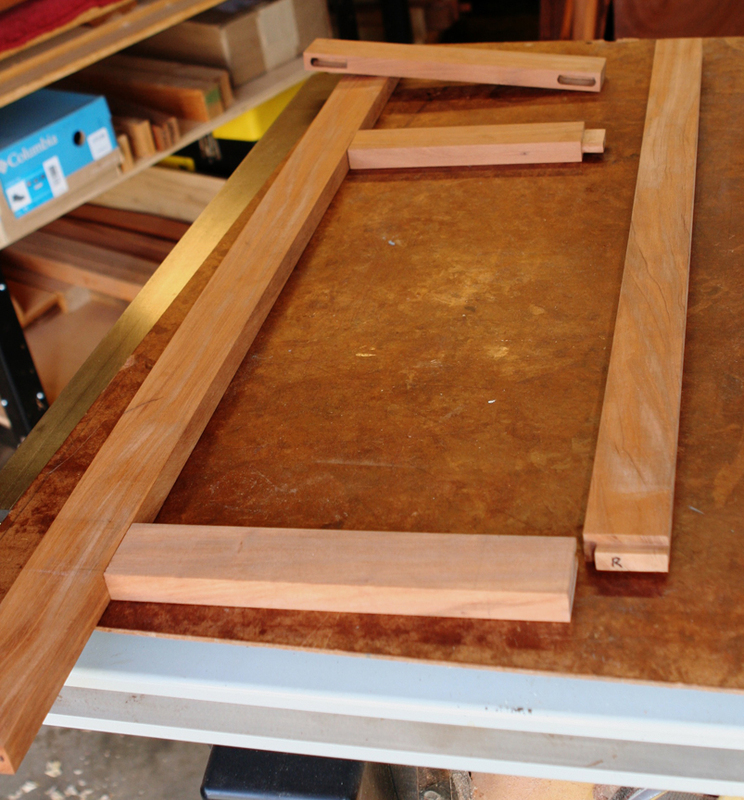 After legs are glued in place, I will fit the doors properly, or my version of proper. 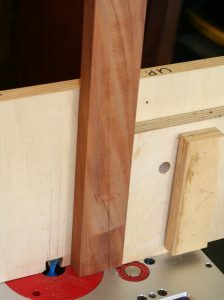 The extended center door stiles will be shaped once I see how the leg shaping turns out. 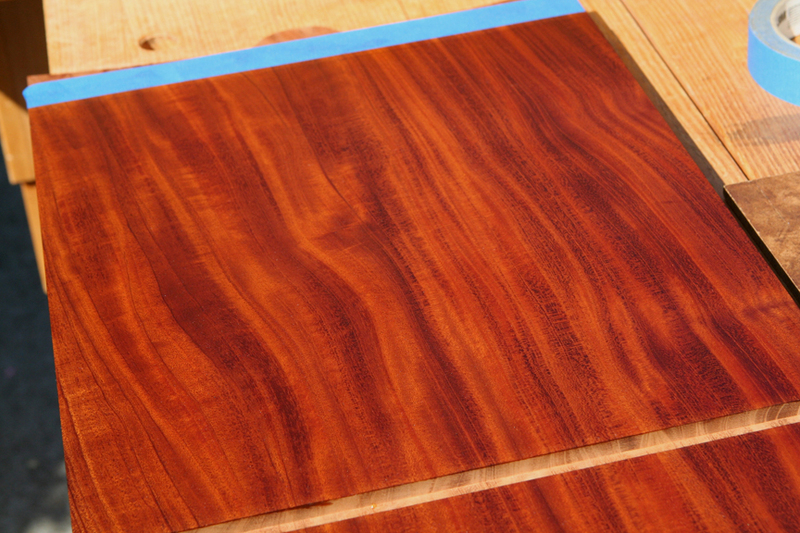 Mixing oil/varnish for mahogany with black milk paint for the poplar components is challenging my brain. 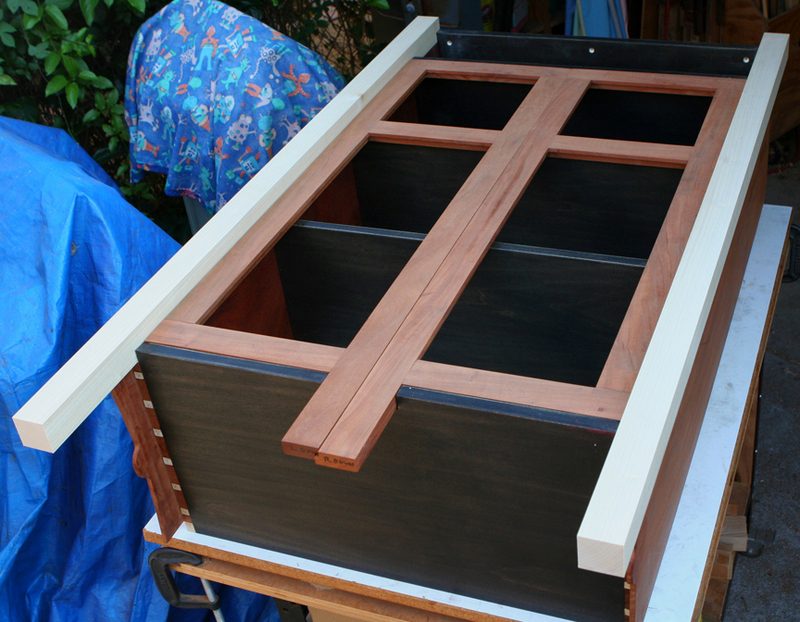 Hopefully, to make things go better, I pre-finished the interior of the mahogany sides and milk paint horizontal elements. 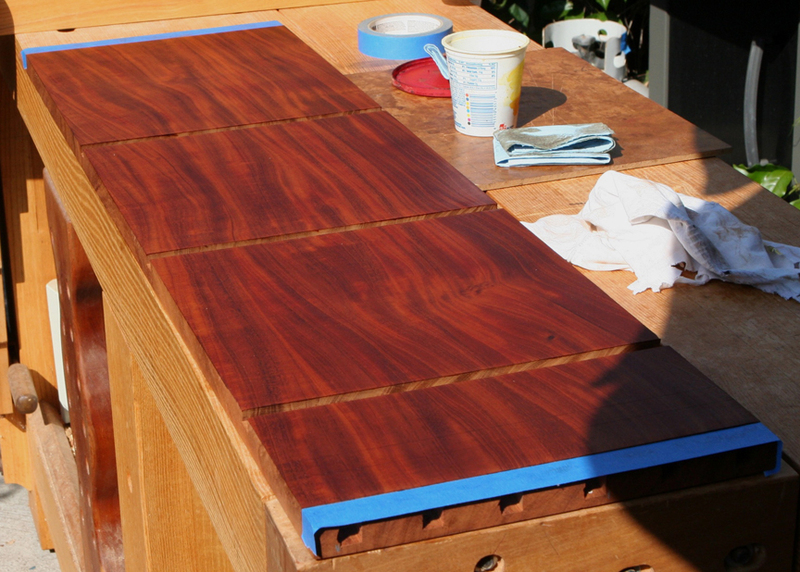 The milk painted pieces also received several top coats of oil/varnish for protection and appearance. I drilled counter sunk holes in the case top. The show top will be attached with #8 screws. 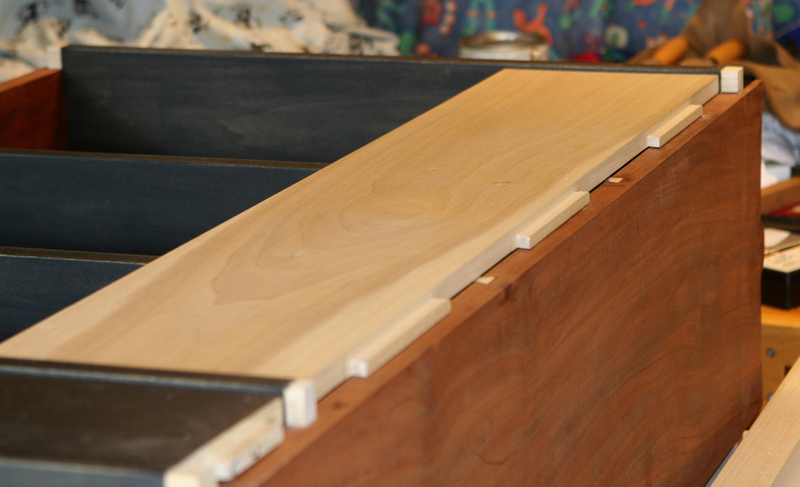 I drilled the front holes for #8 and the rear holes with #10 to allow for movement towards the back of the cabinet. Which should not really be an issue as all grain orientations will be in sync. 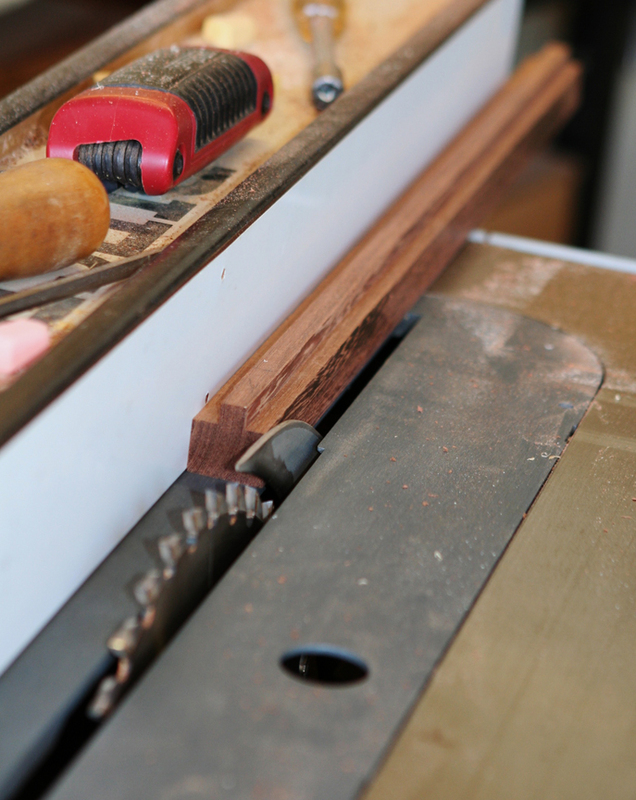 I also drilled pilot holes for the knife hinges. 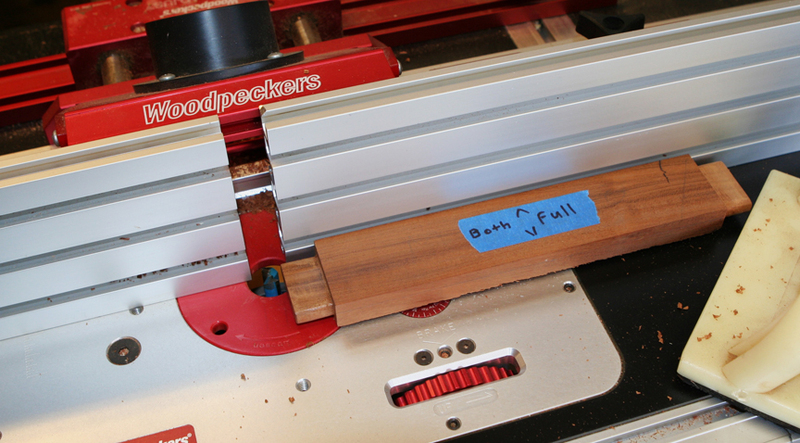 Much easier now, than after glue up. 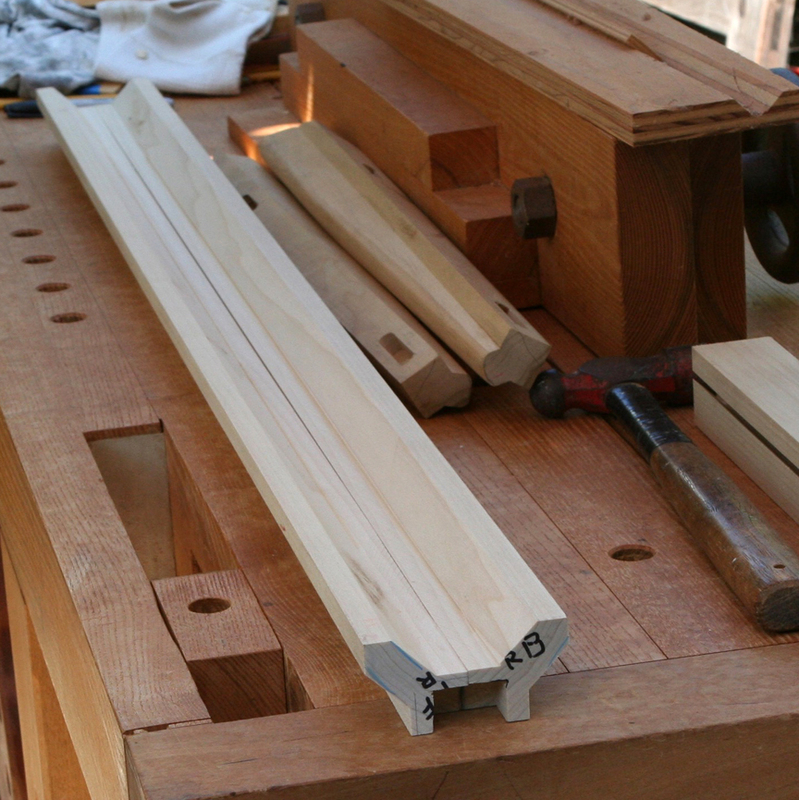 First stage glue up was case top and bottom to the sides. Half-blind dovetails were used for the joinery. 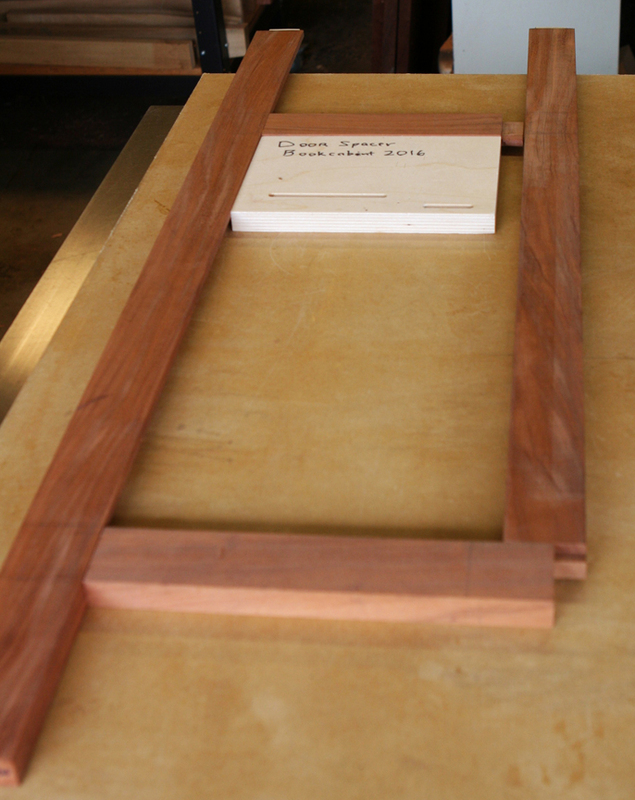 I inserted the shelves to assist keeping the case square. 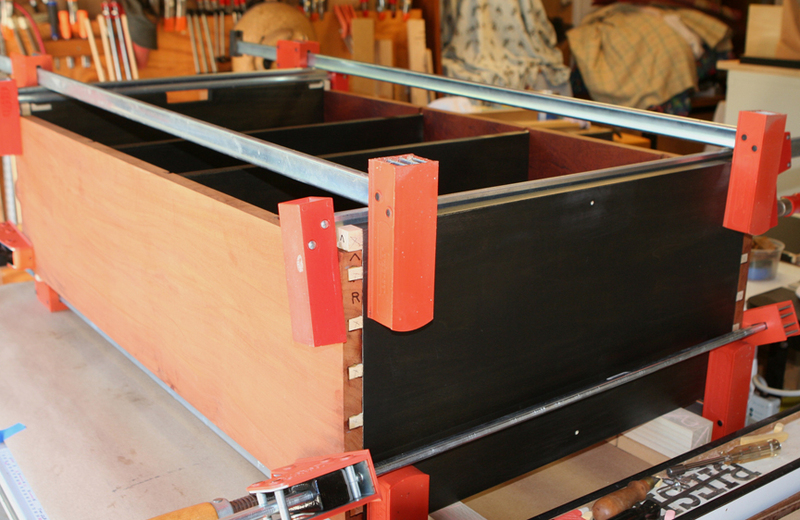 Once that stage set up, I removed the shelves, applied some glue to the back and front of the sliding dovetail joints and applied clamps. Later, I realized my liquid hide glue was far out of date. Hopefully, all of this will hold together. 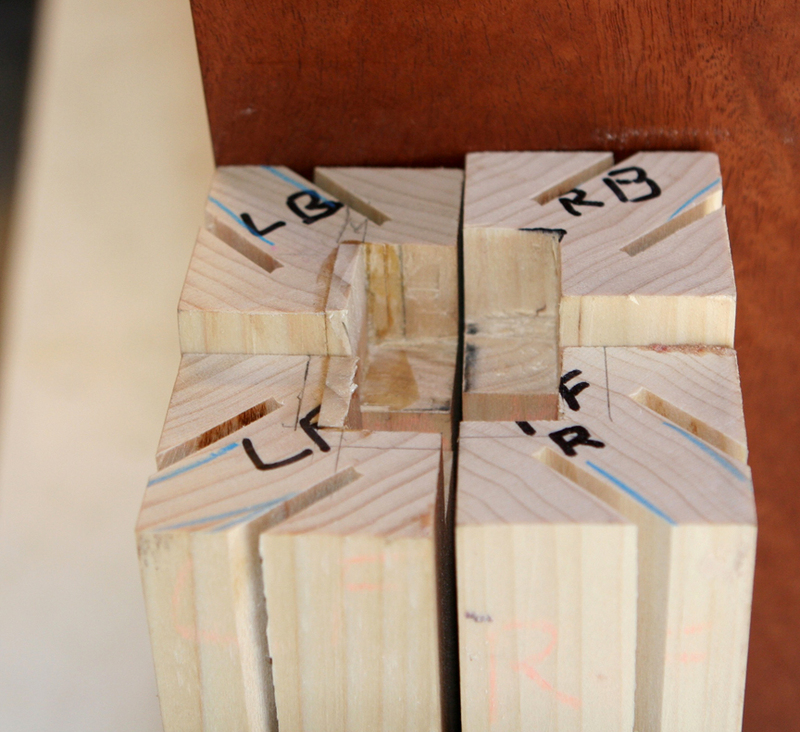 My multi-interlocking joinery addiction should make it work fine for my lifetime at least. 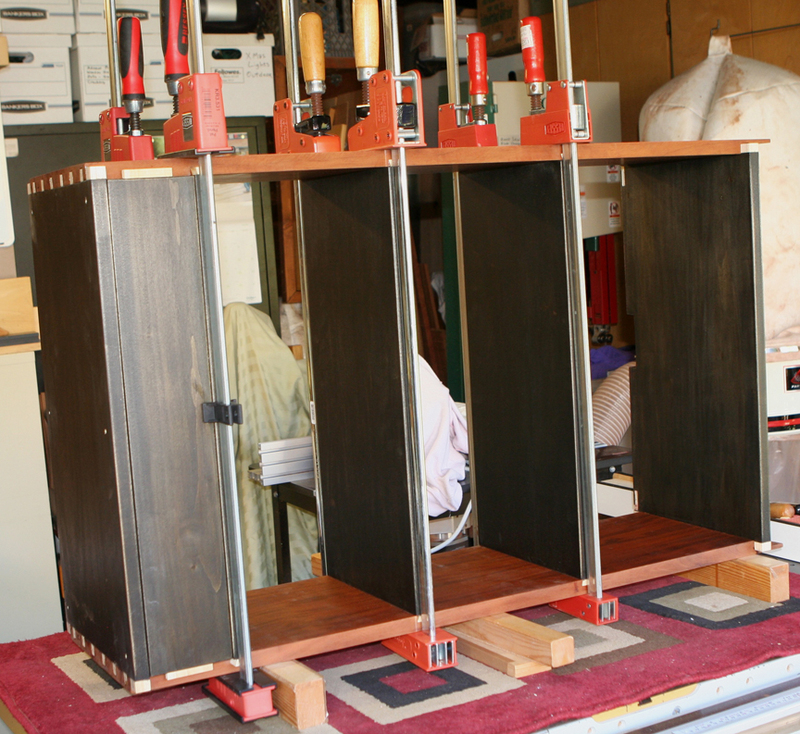 Next we get into the fun feature of this cabinet, the legs. The book cabinet has a wide drawer at the top of the case. 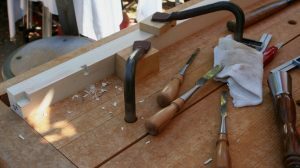 I created the pull similar to those used on my recent dresser project. 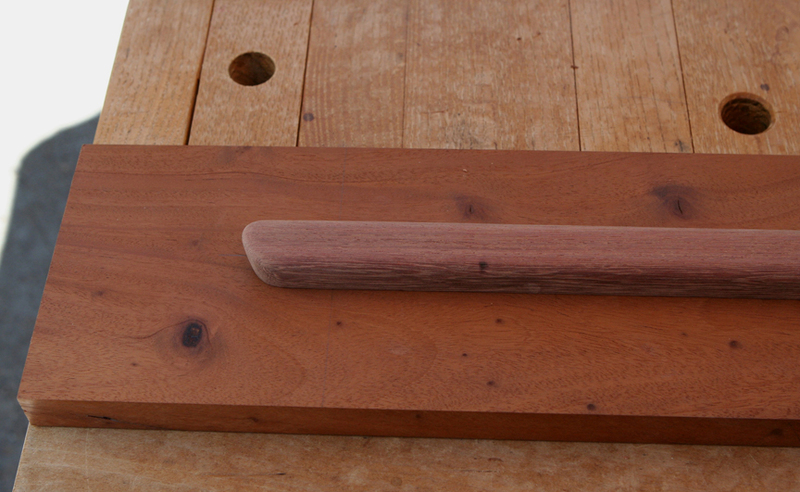 The sinker sapodilla works well with the mahogany drawer front. 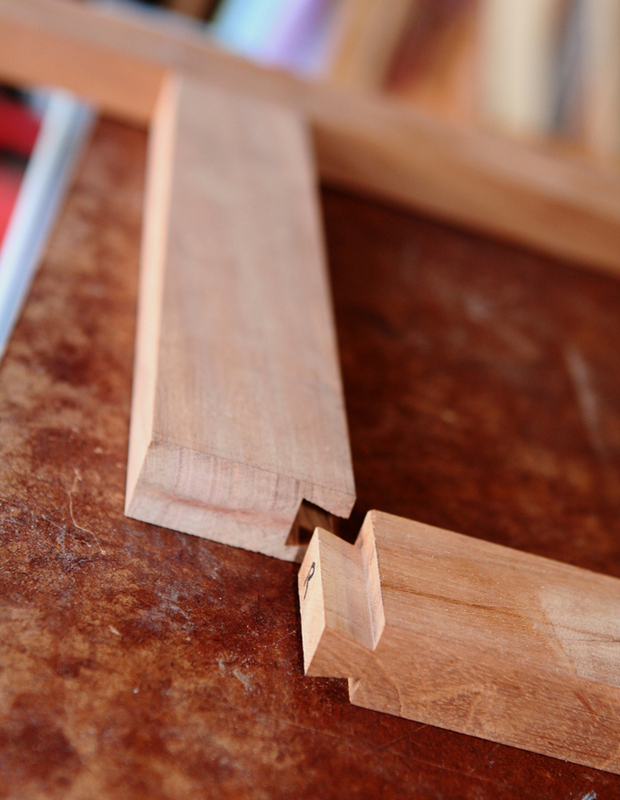 After milling, a long tenon was created at the router table and matching shallow mortise cut on the drawer front. 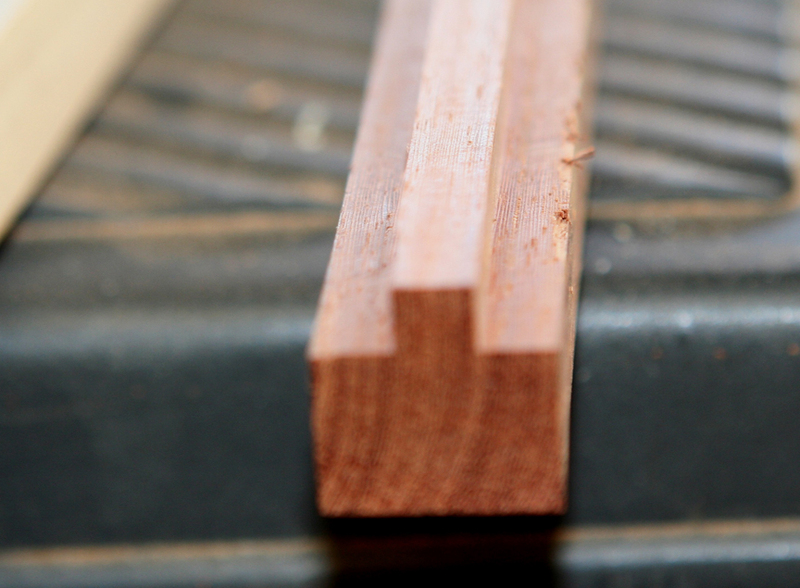 After verifying the fit, I beveled each long surface with rip cuts at the table saw. I used the router to create a round over then shaped the ends with hand tools. 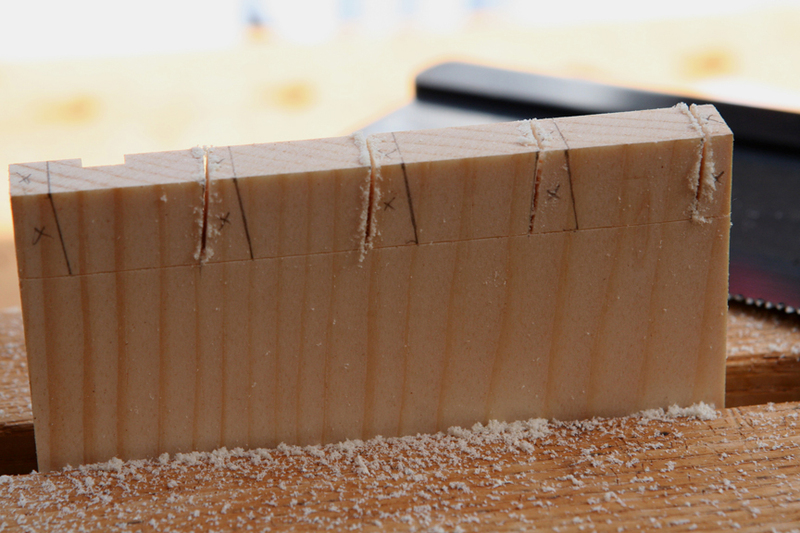 I drew a basic shape freehand and used chisel cuts to those lines, followed by rasps and sanding. 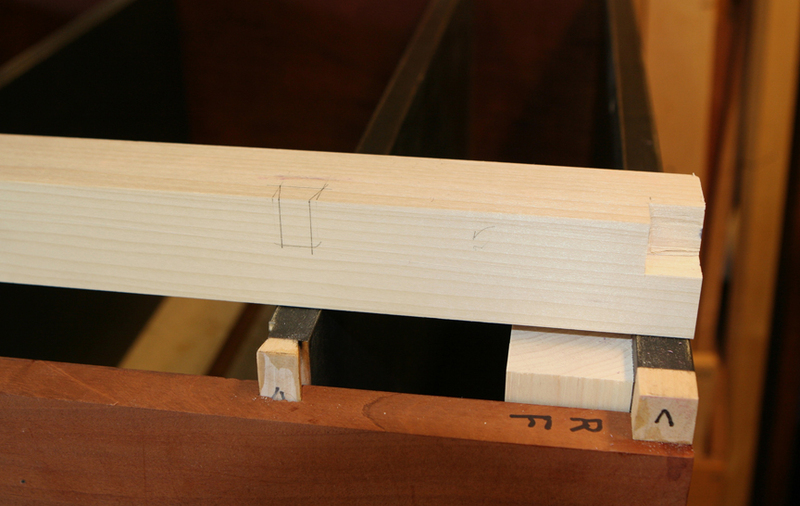 The tenons were trimmed to proper length with back saw and dry fit to drawer front. Looks good to my eye. Will be even sweeter once finish is applied. 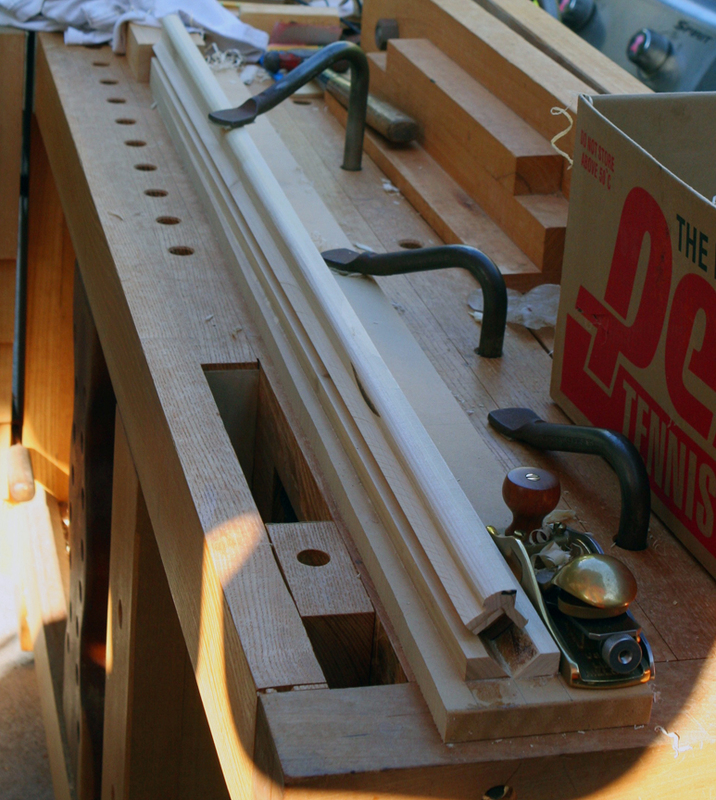 Two counter sunk pilot holes were drilled from the back of the drawer into the pulls. 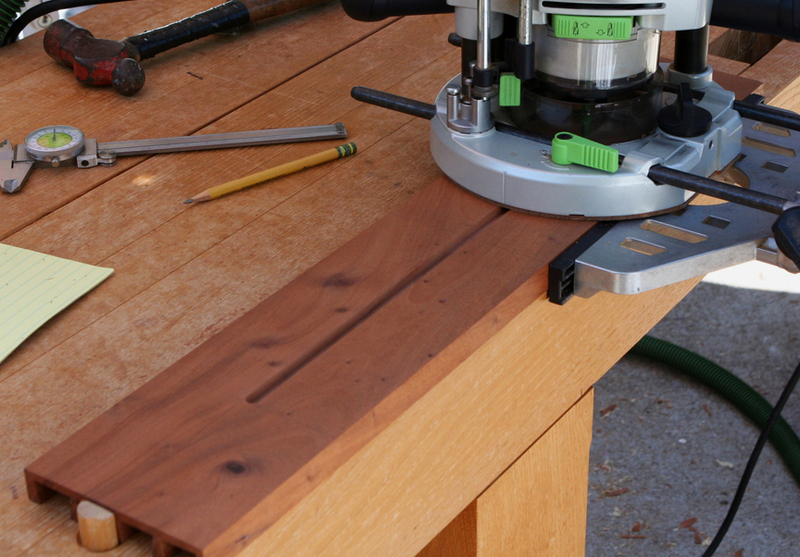 I do not anticipate gluing the pulls into the mortises. 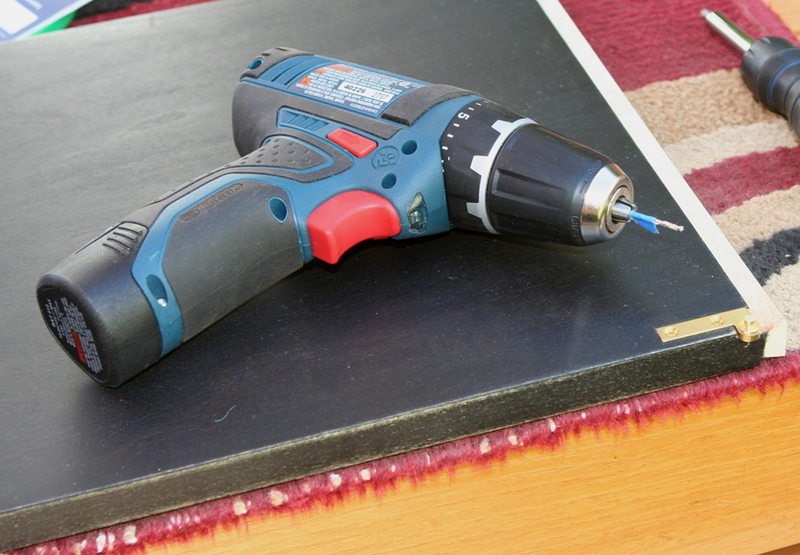 A tight fit and screws should hold fine for its use. 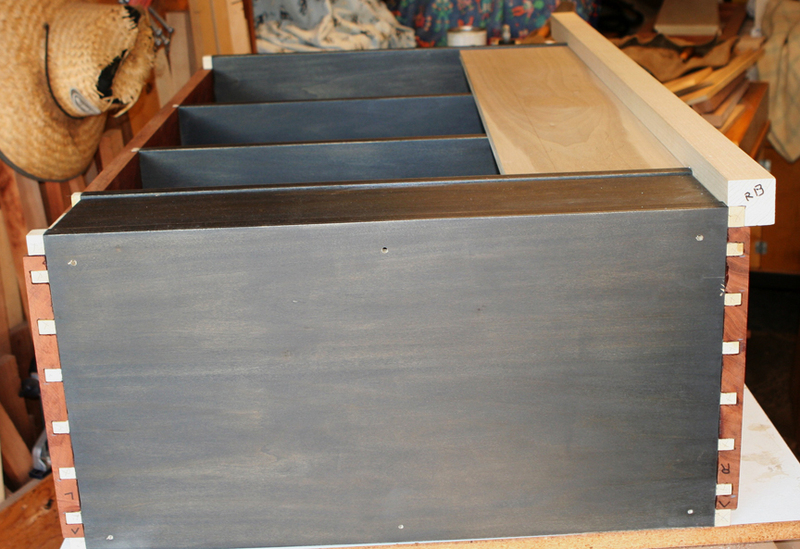 The book cabinet has one shallow, wide drawer at the top of the case. 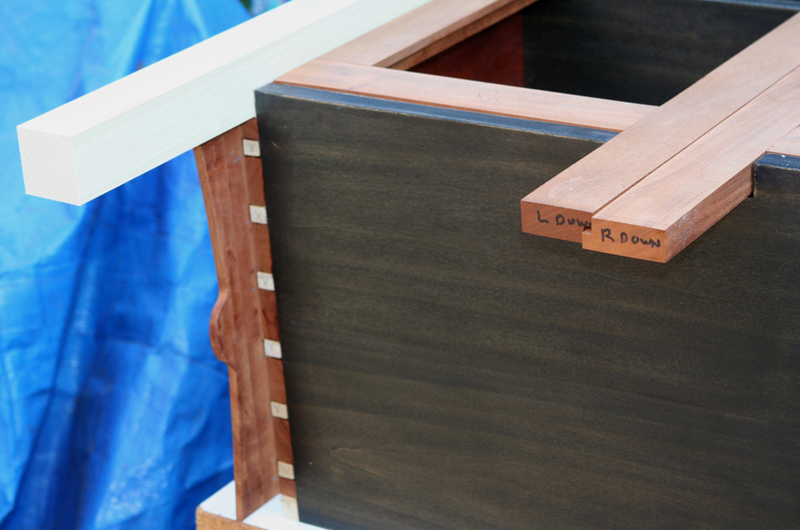 Sugar pine was used for the sides and back, mahogany for the front, and cedar for the drawer bottom. 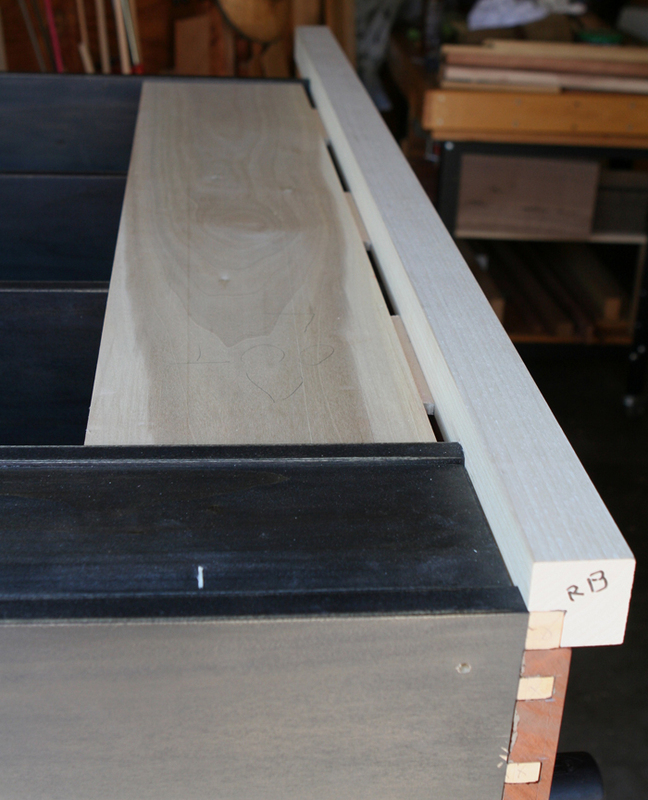 This is a dovetailed drawer with the bottom retained by grooves in the sides and front. 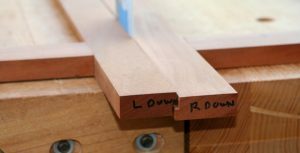 I recently had a three-post series on Half-Blind Dovetail joinery. You may reference that link and follow the path backwards for the other two posts in that series. I use some of these images as well as small test boards. An upcoming post will show the Sapodilla (another sinker wood from Belize) drawer pull details. 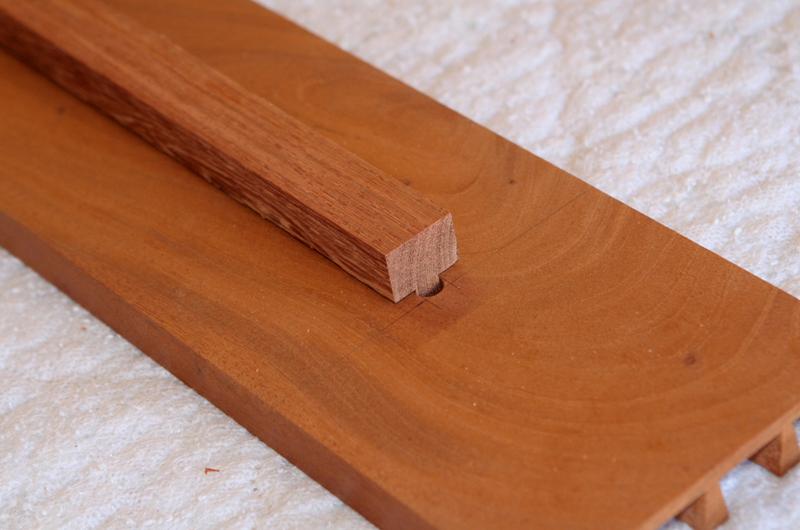 The door bottom rail has a tenon on the inside to mate with a mortise in the long center stile. 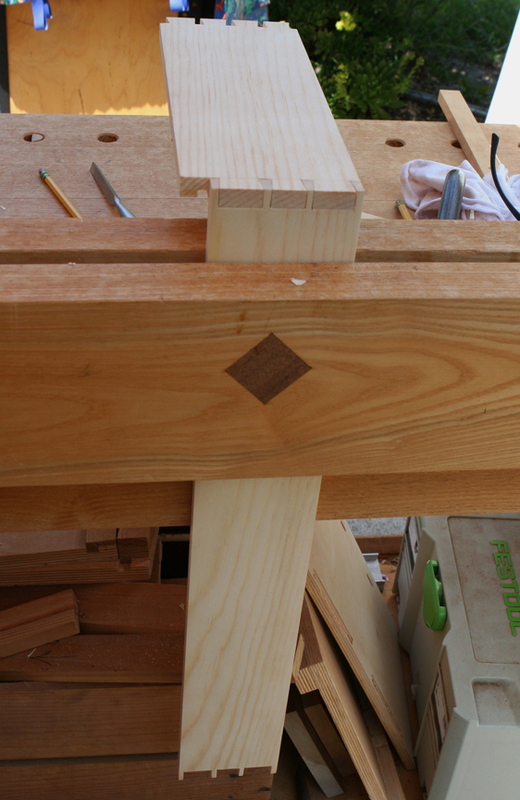 The outside has a sliding dovetail socket to fit dovetail at end of outer stile. 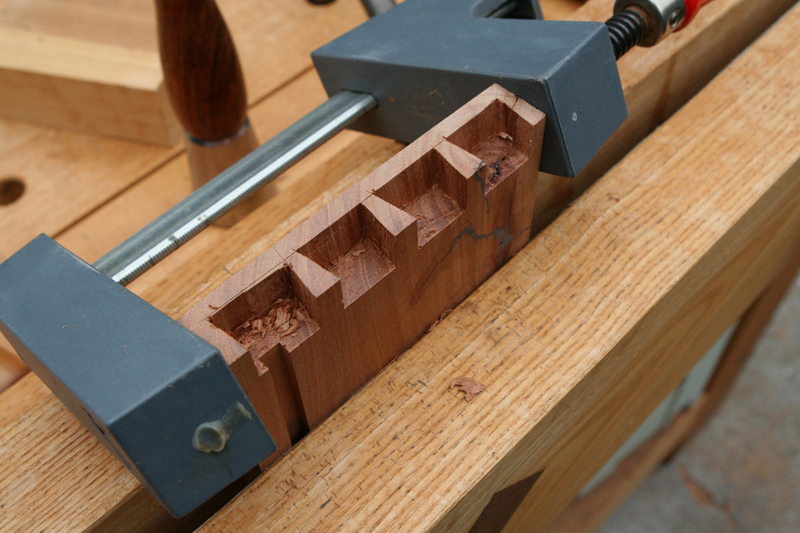 The rail socket was cut at router table, then the dovetail at end of stile cut. 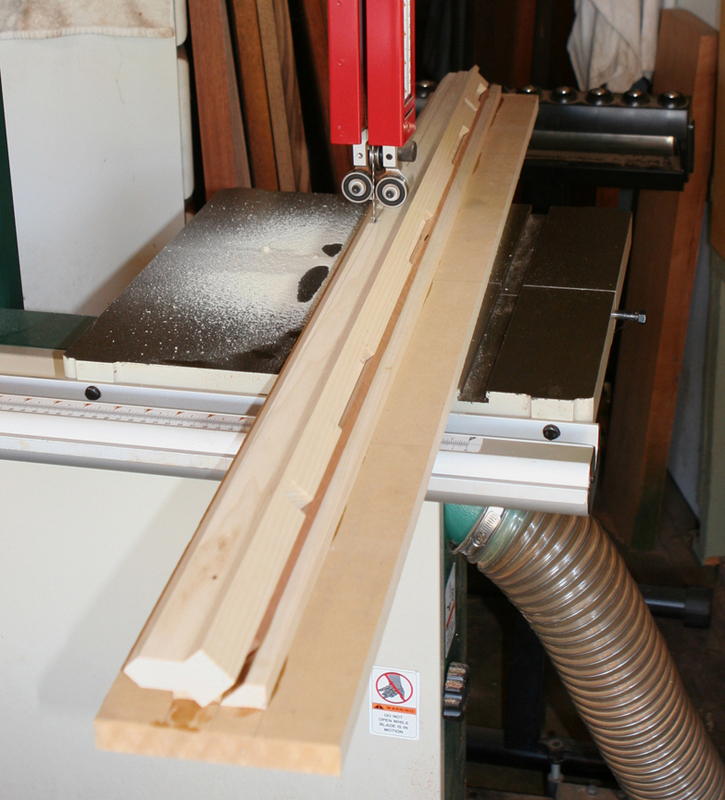 With a tall workpiece and small footprint (working on end), I used a tall fence and extra tall push block to keep things orientated properly through the cut. Very light cuts were made to each side to sneak up on a good fit. That also meant I was not taking a big bite with the tall work piece. Time to focus. Prior to glue up I cut rabbets on inside edges of door components at the router table. 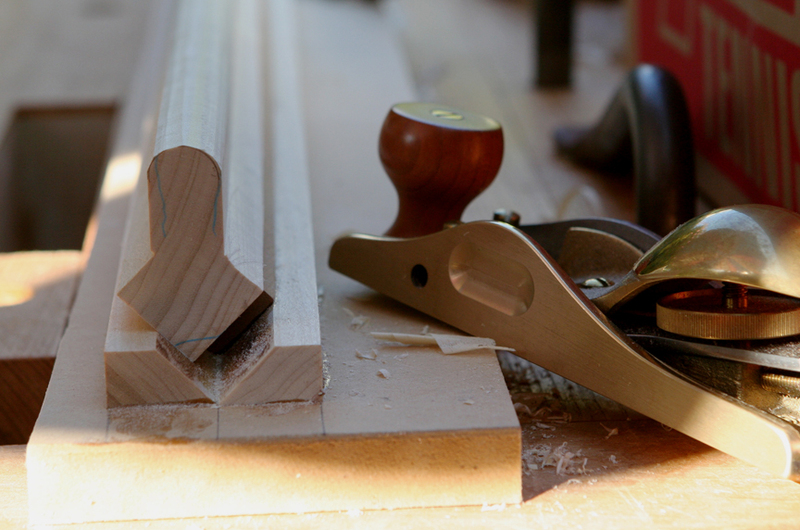 Final trim with chisel will be done after glue up. 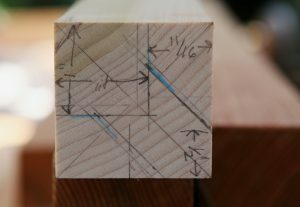 I was having difficulty keeping this asymmetrical layout square and co-planar when checking with my small try square so I cut a large spacer block to assist. 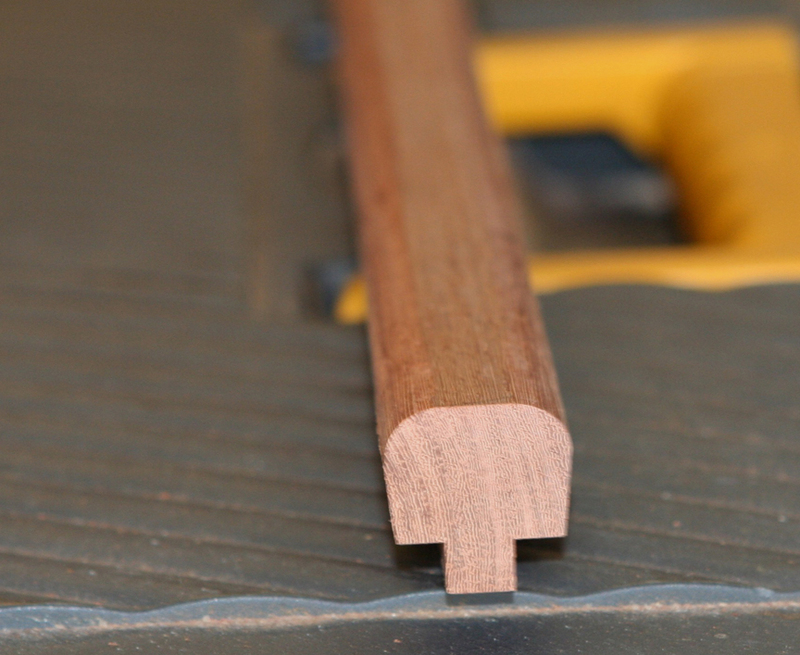 Some adjustments had to be made to the joinery to get things aligned. 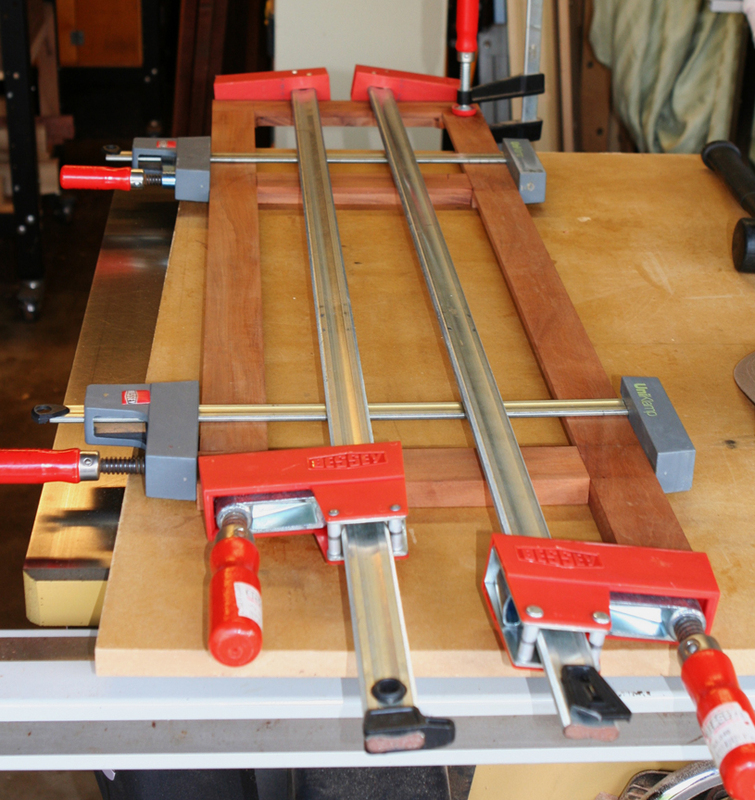 Glue up was done in two stages. 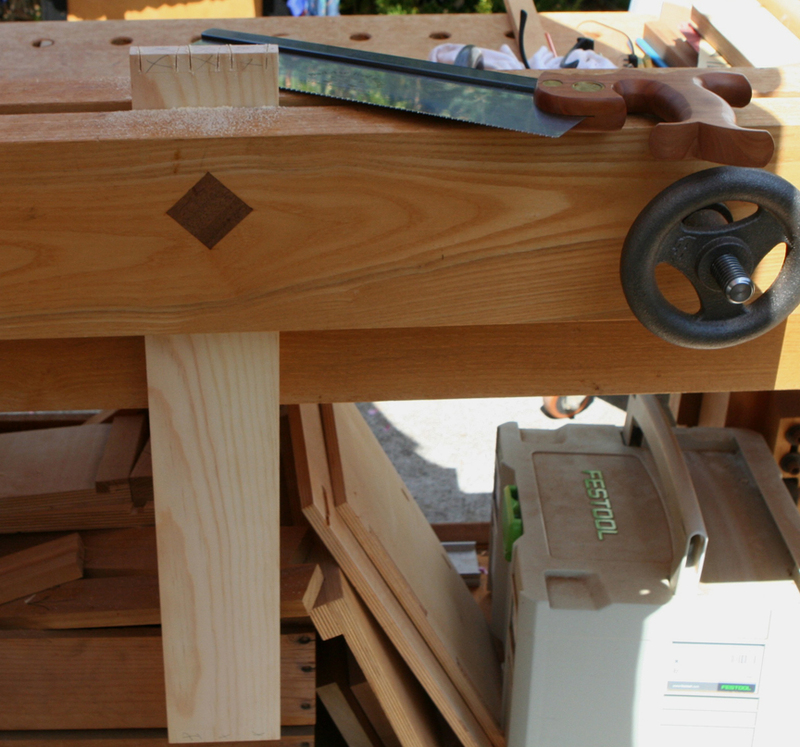 The middle and lower rails were glued to the stiles and clamped. 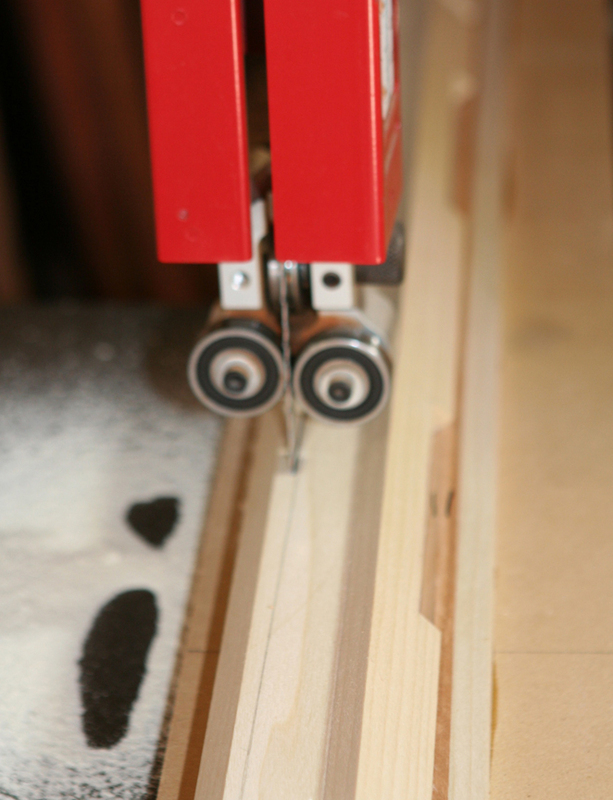 Once that was set, the top rail was glued in place and clamped. 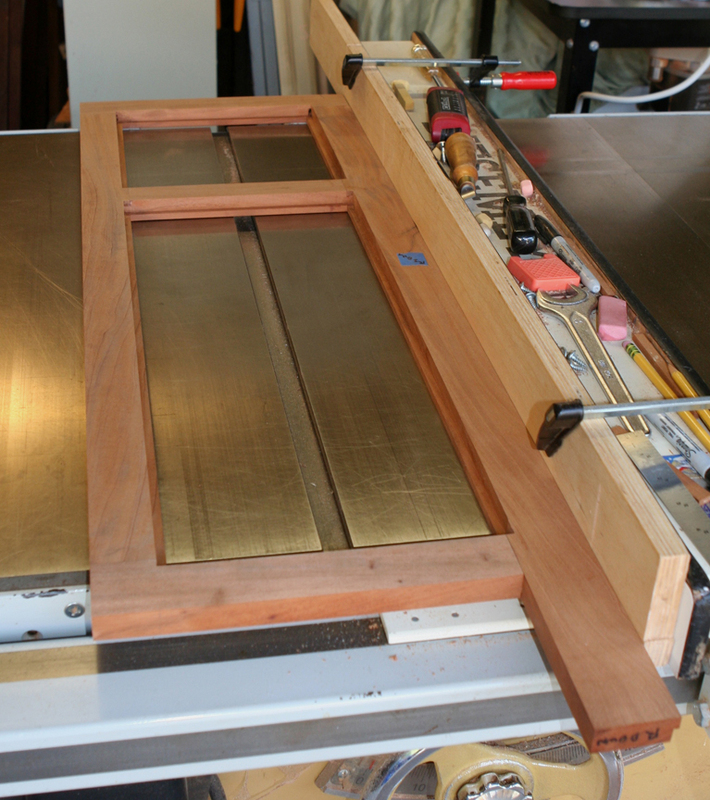 With the door frame together rabbets were cut at the table saw for the doors to overlap in the middle. 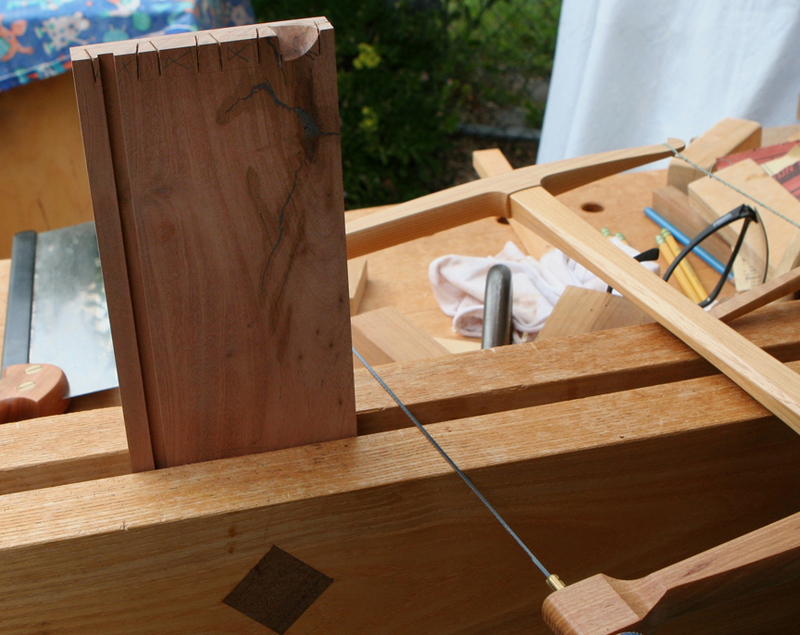 At this time I also squared the interior rabbets to eventually receive glass inserts. 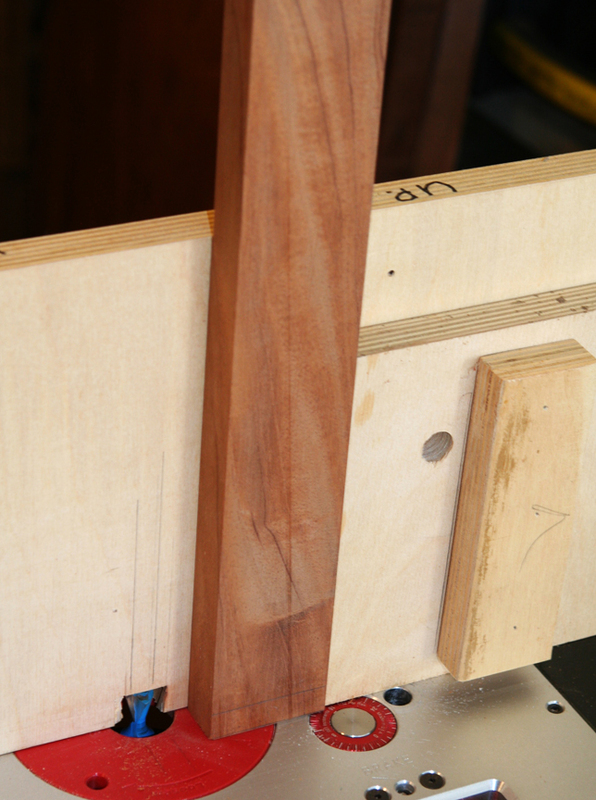 I will wait to shape the bottom of the stiles until I see how things look with the shaped legs in place. Perhaps they will look as if they belong together. A boy can dream.